London Film & Comic-Con is returning for three days of celebrity signings, panel discussions and exclusive previews later this month. A selection of huge names from TV and film will be meeting fans at the event, which takes place at Olympia London between July 27-29. 100,000 people are expected to attend the event and cosplay fancy dress is definitely encouraged. The likes of X-Files star David Duchovny, Aquaman actor Jason Momoa and Transformers star Megan Fox will all be appearing at the event. Duchovny and Fox will both be giving separate talks on the Saturday and Sunday — fans can buy tickets here. Meanwhile, former Doctor Who actors Christopher Eccleston, Matt Smith and Peter Capaldi will be making guest appearances, while Aidan Turner, Val Kilmer, Meat Loaf, James Caan and Steven Seagal will also be in attendance. Some of the most recognisable faces in TV will be making appearances, including Game of Thrones actors Nathalie Emmanuel, Iwan Rheon, Isaac Hempstead Wright, Rory McCann, Paul Kaye, Vladimir Furdik, Julian Glover, Ellie Kendrick. Stars of Blackadder Tim McInnerny, Miranda Richardson, Helen Atkinson-Wood and Tony Robinson will be making guest appearances on Saturday, offering fans the chance to pose for group photos. Dukes of Hazzard stars Tom Wopat, John Schneider and Catherine Bach will be posing for group photos with fans across all three days. There’ll also be a huge amount of merchandise stalls and exhibitors for fans to take in throughout the weekend. Adult ticket prices for individual days start from £17. Tickets for specific events, talks, autograph signings and photos will need to be purchased separately. Megan Fox is seen enjoying a day out at the Audubon Aquarium of the Americas with her friends in Louisana on May 9, 2018. Megan Fox is spotted shopping out in Malibu, CA on April 13, 2018. 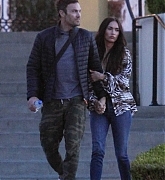 Megan Fox and Brian are seen vacationing in Hawaii on April 1, 2018.